The total number of super funds has more than halved in the past decade, says Rice Warner – and it is likely to reduce by another 60 per cent in the next 10 years. According to a report by superannuation consultant Rice Warner, there are currently 232 superannuation funds in Australia (down from 575 in 2007). 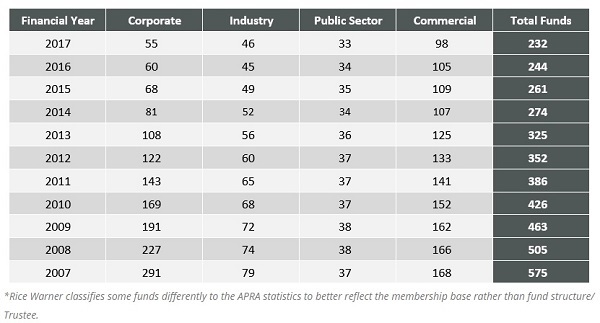 However, the APRA statistics do not include a number of reported (but not yet implemented) mergers, including: Kinetic into Sunsuper, Rio Tinto Staff Super into Equip Super, ANZ selling its super business to IOOF, Tasplan merging with the Tasmanian RBF Accumulation Scheme, and the AON master trust merging with Equity Trustees. But there is a still a "long way to go", according to Rice Warner – noting that there are 79 not-for-profit funds (NFP) with less than $2 billion in funds under management. "This is the same cash flow that AustralianSuper receives every four months. Below that level, funds have higher operational costs and much thinner resources. These funds will not be viable in future so they need a growth strategy," the report said. "We can expect the same reduction in funds (60 per cent) in this decade. That will still give us 55 NFP funds and a smaller number of retail funds. In the latter case, the number of funds is partly a reflection of legacy products and we can expect that many will merge under the same corporate trustee," the report said. Despite the increased consolidation, Australians will still have a "vibrant" superannuation sector with plenty of choice available, it said. "Ironically, the rationalisation of large default funds is being countered by a proliferation of tiny start-up (Choice) funds as well as the continued growth of SMSFs (up by 100,000 funds in five years)," said Rice Warner. "Though the growth of SMSFs will continue for some time most of these start-up funds will run out of capital quickly and they will need to be absorbed by larger funds. Perhaps one or two might survive as small niche funds. "Rationalisation is good for members. It drives down fees and improves investment strategies and member engagement. Further mergers will be beneficial and still leave us with a healthy competitive marketplace."